Please consider we do offer free returns only from Germany and Austria. If your delivery address was Germany please click on Online Return and follow the instructions from our logistic partner BPS. In order to help us to identify your return, it is important to place your Order ID in the field "Referenz". You do not have to register on that website. Just fill in your sender address and Order ID and drop off at a GLS depot. Pls. 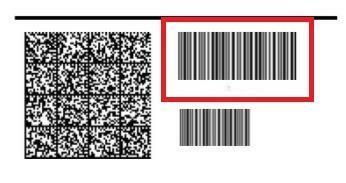 make sure that the personal at the GLS Shop scan the code (here with the red frame) as seen below. Below the bar code numbers are seen which can also be typed in the system. Did we deliver to a country outside Germany/Austria please send back the goods on your own cost to the address mention in the imprint. You might install Adobe Reader to open the return ticket.